Why Is Murphy Haunting Me? 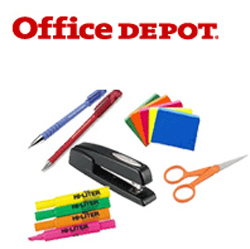 I am not sure about in other areas, but around here, Office Depot puts out school lists for supplies. They are never right and all the teachers have their own lists. Red pens and not black. Green dry erase markers. So, yesterday morning (after two full days and all classes) I head to Office Depot at 730am (by the way a great time to shop there) to do the back to school shopping. $140 later and we are stocked up and the teachers have their Kleenex, hand sanitizers and the other stuff that they like and the schools don’t supply. I am so proud of myself that I am a smart shopper. Bought the ten cent pencil packs, the generic dividers, store brand composition books. I was a happy camper! After school the kids tore through the stuff and there was nothing missed, so they were happy campers too! This morning, Murphy raised his ugly head and delivered a $40 off any purchase of $100 or more coupon from Office Depot! I mean really, what are they doing, watching me and timing it so I can’t use it! 1 Comment on "Why Is Murphy Haunting Me?" Dating for single parents can, at times, be depressing, disappointing and apparently hopeless. However, the picture is not as bleak as it is made out to be. The single most decisive factor in two strangers clicking with each other is if they share something in common. In that case, there can be no greater base for a stable relationship than sharing the pleasures of parenthood.